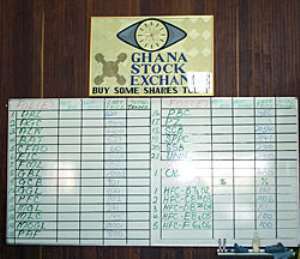 Accra, Jan. 10, GNA - The Ghana Stock Exchange (GSE) went up in moderate trading on Monday with investors sitting on the sidelines. The GSE All-Share Index, the main stock index, recorded a 2.38-point gain to end the day at 6,811.03 points. Change for the year ended at 0.18 per cent while market capitalisation closed at 97,648.75 billion cedis from 3,663.42 million shares. There were three price changes, all positive. Paterson Zochonis (PZ) jumped up by 149 cedis at 4,850 cedis, Starwin Products Limited (SPL) was 29 cedis better at 680 cedis while Benso Oil Palm Plantation (BOPP) was five cedis up at 6,565 cedis. Total shares that changed hands slumped to 195,000 from Friday's 1,260,400.